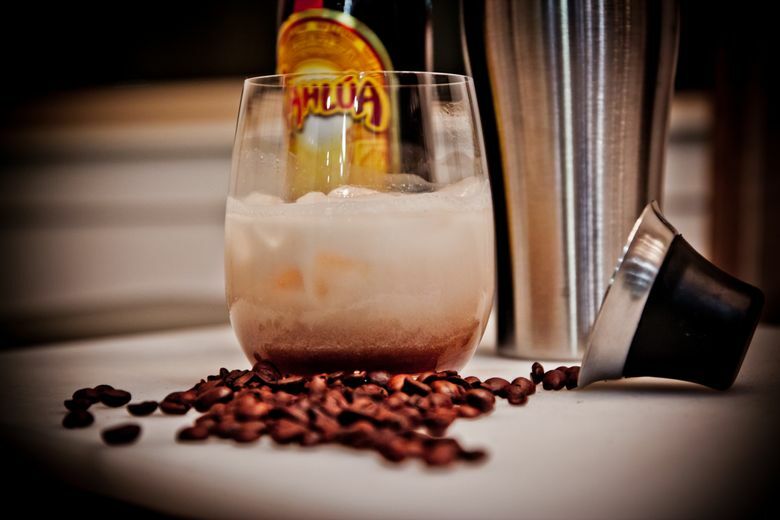 Ditch the tiki-torch-sweet Kahlúa and Tia Maria White Russians for home-brewed boozy, caffeinated creations. SEATTLE SHOULD, in theory, be crazy about coffee liqueur. Combining caffeine and alcohol is the ultimate legal speedball, an up-and-down roller-coaster ride of acceptable vices (though the concept often manifests as vomitous chimeras like Red Bull and vodka) that fits in perfectly with Seattle’s “hurry up and relax” attitude. 1. Combine the sugar and water in a saucepan, and bring to a boil. Remove from the heat, and let cool. This is your simple syrup. 2. When cool, combine simple syrup, coffee, alcohol and vanilla bean in a large glass jar. Let it sit for at least a day, and enjoy. And, alcoholic forms of coffee should hold particular appeal to Seattleites, for whom dark-roast drip can be used to replace blood plasma. So why is coffee liqueur not the official state libation? Why do we turn our noses up at it as outdated and kitschy, relegating it to dessert cocktails and bonbon flavoring? Part of the problem is that the most well-known coffee liqueurs are, of course, Kahlúa and Tia Maria, mass-produced bar staples with a bit of a “tiki” reputation that generally form the basis of sticky-sweet drinks like the White Russian. During a brief period in my life when I was both experimenting with laziness as a lifestyle choice and just learning how to drink (i.e. around the age of 21), I was really into White Russians, which have long been synonymous with The Dude in the movie “The Big Lebowski,” thereby adding to coffee liqueur’s vaguely seedy image. White Russians, which are made with cream, Kahlúa and vodka, can be nauseating (I had a stronger stomach when I was 21), because the drink is basically the alcoholic equivalent of a Starbucks Frappuccino, and not something that any serious, rain-drenched, lunchtime-jogging Puget Sounder would drink after 5 p.m. But it doesn’t have to be this way. With a little (very little, I promise) elbow grease, you can make your own coffee liqueur, and your favorite local third-wave roasts (Slate! Caffe Umbria! Victrola!) can become the basis of your cocktails. Coffee liqueur is made by combining brewed coffee (some people swear by drip, others cold-brew, but it is best for it to be very strong, so skip the French press) with hard alcohol (vodka will bring no extraneous flavors to the party, but feel free to experiment with rum, bourbon or perhaps even a fine malt whiskey, and don’t be cheap — remember, your liqueur is only as good as your base spirit) and a sugar syrup made by boiling sugar (white, brown or perhaps even coconut) with water and a vanilla bean. Combine in a jar, let it sit in the fridge for a day (yes — you can wait a day; drink something else), and you’ve got yourself the sweet nectar of the coffee gods, artisanal and local, maybe even bird-safe and organic and drenched in terroir, with nary a tiki torch to be found. And you don’t have to add cream to this coffee — skip the White Russian, and make yourself a Revolver (bourbon, coffee liqueur and orange bitters) instead. But if even that’s too much cooking for you, Seattle Distilling on Vashon Island makes a version with The Vashon Island Coffee Roasterie coffee (the Orca blend could support your White Russian habit and our favorite local whales). Rain City Spirits makes a “Drip Coffee Liqueur” with Caffe Vita’s coffee that has the manly tinge of a hot black cup of Joe. And of course, the 900-pound elephant in the room, Starbucks, apparently even once had its own coffee liqueur created as a co-brand with Jim Beam and now, sadly, discontinued, though you can still make your own with its ubiquitous beans. In this town, I think that counts as local, too.